The site of Woodhenge is not one which, on first sight, is attractive to either the casual visitor or the dowser. Although it is situated in pleasant, rolling countryside a few miles from Stonehenge all that can be seen of its past is a jumble of short, concrete posts which mark the positions of the concentric rings of mighty tree trunks which once stood there. The name Woodhenge was given, partly in jest, to distinguish it from its neighbour Stonehenge and the name has stuck. Fig. 1 is a plan of the site showing the positions of the posts as drawn by Maud Cunnington and her husband who excavated them in the 1930s. The reader can guess how confusing the arrangement can look on the ground. People who have never examined a plan of the site often describe it as a series of six concentric circles but, as one can see, the shapes are not circular but oval or elliptical. Each small circle on the drawing represents an excavated post hole, the smaller ones of which once contained posts of 15 to 24 ins in diameter and from 12 to 16ft high. The larger posts were a massive 3ft in diameter, may have been 30ft high and weighed several tons. It can be imagined how difficult it must have been to cut and trim the trees and to transport and raise such unwieldy objects with primitive tools. The Cunningtons who first excavated the site assumed that all the rings of posts were raised in the same time period. This assumption was ‘proved’ by the carbon dating of a sample from one post hole and this result was used to show that the structure had been a huge circular hut, 155ft in diameter. Its thatched roof, supported by a maze of posts, supposedly had a hole in the centre to let out the smoke from sacrificial fires. Surrounding it was a bank with a ditch on the inside which indicates that it was not dug for defensive purposes. There are other banked and ditched henge sites in south and south west England where concentric rings of postholes have been uncovered and in each case the archaeologists have assumed that all the posts were raised in the same time period. 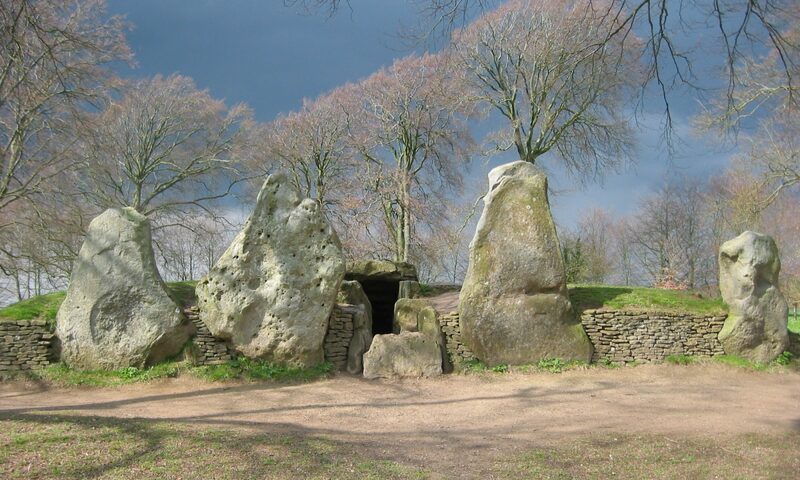 It was only quite recently that this theory was cast in doubt by an excavator at the Sanctuary, near Avebury, who upset the establishment by concluding that the rings were of successively different dates.. The new information gained from the Sanctuary has now been applied to Woodhenge and the posts are now believed to be components of sun calendars aligned on midsummer sunrise, the first rays of which would have passed through the gap in the surrounding bank. Indeed a famous engineer and surveyor, Alexander Thom, has made very precise measurements over the concrete posts, to confirm not only the alignment to midsummer sunrise, but also calculating that the ellipses were carefully marked out in geometrical fashion. Unfortunately no-one told him that the modern concrete markers are not all accurately centred over the post holes beneath, thus making nonsense of his conclusions. In spite of the foot and mouth scare which limited access for a time I gathered enough information to allow me to complete the investigation by accurate map dowsing. As in so many other cases I have found that the archaeologists missed many important remains below ground but one must not be too critical; a site which has received heavy usage is impossible to evaluate accurately by excavation as each new structure destroys those preceding it. I began my site dowsing on the low outer bank using angle rods. Can you tell me whether it covers the sites of earlier banks? Yes. Does it cover one…two…three etc……..sites of banks? The answer was six and, by later dowsing I found that the original excavators had missed a small, inner ring of posts. Can you date the banks for me? Yes. Considering the oldest bank was it built more than 2000…3000…etc years ago? Answer 4860 years ago (2860 BC). The other banks were then dated to confirm the figures obtained below for the rings of posts. Then I moved to the barely visible gap in the bank. Did all the banks have a gap at this point? No. Did any banks have a gap here? No. This was a big surprise. Later work showed that the present entrance was made in about AD 1380 when the banked and ditched area was used as a corral. At this point I moved inside to the concrete posts marking the approximate positions of the ancient posts and dowsed over one marker of each ring in turn. The results showed a succession of dates. The innermost ring of posts were raised in 2260 BC, the next in 1530 BC then 1260 BC. The largest posts were placed in 550 BC and the two outer rings in 380 BC and AD 20. Within the innermost ring it can be seen in Fig 1 that there is a small rectangle. It represents the position of a burial of a small girl child who was killed in 1340 BC, perhaps as a sacrifice, by a vicious axe blow which cleaved her skull in two. At present the grave is covered by a low mound of cemented flints and can easily be seen in the rough grass. Even on a hot day the Woodhenge site is exposed and often cold and windy so it was no hardship to complete my investigation over a drawing in the comfort of my home. Without some sort of guidelines it is very difficult to locate the positions of items or their ‘shadows’ [remanence] on a small scale diagram. To increase accuracy I draw a grid on the plan at an arbitrary scale and then dowse each square separately. On this A4 plan I used 3cm squares (equivalent to 15m or about 50ft) giving me 80 areas to dowse. With a pencil in my left hand I can then point to places within each square and ask questions with the pendulum in my right. Can you see this square which represents a part of the Woodhenge site? Yes. Give me a ‘yes’ when my pencil point passes over the position of a subject of interest. It is surprising how often the answer is ‘yes’! On the original plan (Fig. 1) all rings except that with the largest posts were calendars, all five of them being orientated towards midsummer sunset not, as the ovals are orientated and the experts have concluded, towards midsummer sunrise. That with the huge posts was a sacrificial circle raised in 550 BC, inclined towards midwinter sunrise and originally with a stone altar slab inside the posts to the north west. Stone altar slabs were also features of the post and stone rows shown in the diagram (Fig. 2). These rows were the forerunners of [and sometimes the alternatives to] the sacrificial circles. They were orientated to a specific sunrise or sunset -here midsummer sunset- and the altar was placed at the opposite end in front of the blocking posts. Chanting, songs of praise and ritual parades were all a part of the ceremony and, when the first (or last) rays of the sun struck the altar, the sacrifice was made. What I have not included in Fig. 2 is the range of banks and ditches which were obscured or destroyed by those we can see today. Each circle had its own bank and ditch suitable for its alignment but the experts have assumed that all those originally identified used the one entrance shown. My dowsing has shown that it was actually opened in about AD 1380 when the central area was used as a corral for cattle or sheep. One other question about Woodhenge must have occurred to you – why were the rings elliptical? It turned out to be a simple answer: there were trees in the way of making the first one circular and subsequent constructers roughly followed the outline of the first, being able to ‘feel’ the shape even ‘though they couldn’t see any remains. Well, that’s enough of the technical stuff; what can an ordinary dowser find on the site? There is not much point in dowsing for post holes, they are present in confusing abundance. The child’s grave is sad but interesting and there are many other places particularly around the sites of the stone and post rows, where powerful emotions have been implanted by the crowds of prehistoric worshippers. You could also look for the several burials which have been found by excavators but which are not shown on my plan. Water lines are abundant over the whole area, each structure being carefully placed over a significant ‘energy’ generated by the flowing water. Energy lines (energy leys) are few in number. I have generally found that man made lines such as these (I believe that they were laid down in antiquity as telepathic communication lines) were not intentionally associated with sacred sites; areas devoted to worship of any sort were kept free of man made artefacts such as energy lines, huts or burials. Incidentally, it is most important to remember that overlapping features shown in Fig. 2 were constructed at widely different dates. The site has been used frequently from the time of the first stone row[upper left] at 6360 BC to the time of the last post ring (Fig. 1) at AD 20, and then again as a corral for animals in the Middle Ages.